Overlap two congruent circles until the three areas formed are equal. What is the distance between the centers of the two circles, and what is the common area of the three regions? For simplicity, use unit circles (radius 1). The slider moves one of the circles and displays the distance between their centers. The checkboxes allow the display of circle centers, boundaries, and the numerical values of the areas. To find the desired overlap area , recall that the area of a circle is , and then require that , which can immediately be solved to find that . To find the distance , remember that the area of a circular sector of angle and radius is . (This gives the expected area for the whole circle when .) Half of the overlap area can be found by subtracting the area of the isosceles triangle formed by the intersections of the two circles and the center of one of them from the sector area, and then doubling gives the area of the lens in terms of and : . The distance between the two centers is given by . Setting and numerically solving for and gives and . The overlap area can also be found using integral calculus. For convenience, we again let the radius of the circles be 1. Then the area of each circle is , and the area of each of the regions must be . Let the centers of the two circles be and , respectively. The lens is symmetric vertically and horizontally, and one quarter of it is bounded by , , and the circle . So . Setting this equal to and solving numerically for again gives approximately 0.807946. See  for a solution arrived at independently. The alert reader may have recognized the numeric value of the equal areas shown in the display, 1.570796327, as approximately , and we have seen that this is no coincidence. But the numerical value of the distance between circle centers has no immediately obvious significance and cannot even be determined precisely, except as the solution to the transcendental equation above. MathZombie. 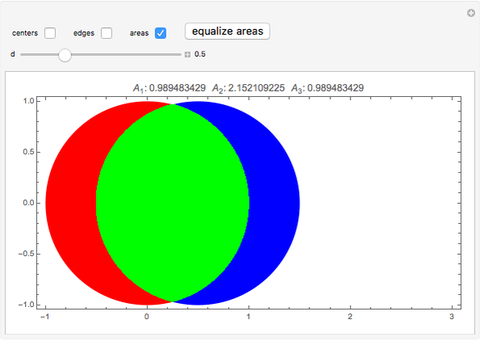 "How to Create a Two Circle Venn Diagram with 3 Equal Sections?" Mathematics Stack Exchange. 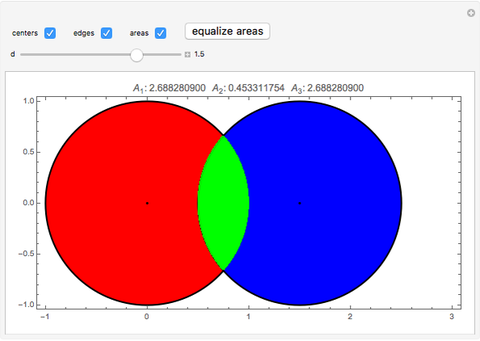 (Aug 28, 2014) math.stackexchange.com/questions/769136/how-to-create-a-two-circle-venn-diagram-with-3-equal-sections. Kenneth E. Caviness and Eugene Stewart "Making the Three Areas Defined by Congruent Overlapping Circles Equal"